Small Town Superhero 3 is the finale of Kelson’s story as written by Cheree Alsop. There’s copycat Black Riders threatening Sparrow and destroying the reputation of the real Black Rider. Kelson feels like the whole town has turned on him in an instant. The town he has bled and suffered to protect. But he can’t just lay down and let this new batch of highly trained fighters get away with hurting his town. Not while he can still ride. So the Black Rider fights back, and this time, it may take everything he’s got to protect the ones that really matter. Author Cheree Alsop does a phenomenal job with portraying the struggle in Kelson. He’s so in pain when the town turns on him, but it’s not in his nature to stop fighting. Kelson realizes what’s really important, and who his friends are. 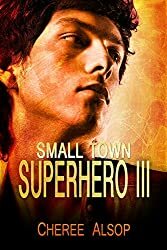 If you like the sound of Kelson’s story, check out the rest of the Small Town Superhero books here or on Author Cheree Alsop’s website. Oh, and she’s got several other series I’d highly recommend: the Silver Series, Heart of the Wolf, and Stolen.